Herb Alpert was born in Los Angeles in 1935 and he lives here still. His father, a Russian Jew from Kiev, was a tailor. His mother, of Hungarian descent, encouraged his music, giving him a trumpet on his eighth birthday. Alpert grew up in Fairfax district, the second Jewish neighborhood in Los Angeles after Boyle Heights. It was there, in the ‘hood, in a home recording studio, that Alpert concocted his first hit. Years of hawking singles to distracted deejays sent the frustrated Alpert to Tijuana, but not for the standard south-of-the-border debauch. Instead, he returned to L.A. smitten by mariachi’s sweet-and-sour blend of guitar and horn. Back in the family garage/studio, Alpert mixed The Lonely Bull — a plaintive solo trumpet line interwoven with bullfight crowd noise. This mildy exotic sound infiltrated American radio waves in 1962 during the cultural vacuum that preceded the British invasion. 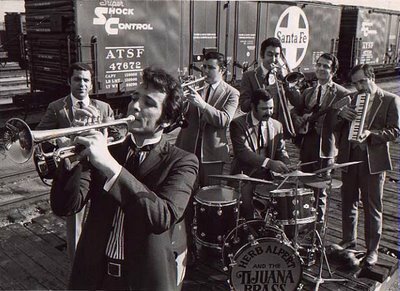 Soon Alpert was scrambling to flesh out his studio-cooked music with a real band called Tijuana Brass. The group of gringos (mostly Jewish guys) and a few others Alpert knew from the USC marching band fobbed themselves off as true Mexican mariachis. 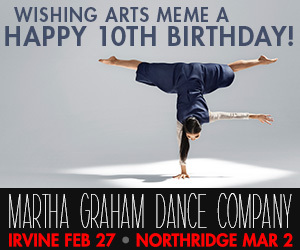 Now even in Fairfax district that’s called chutzpah. 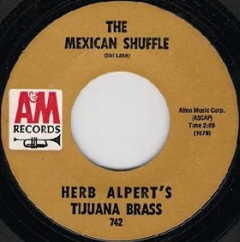 Alpert’s Mexican Shuffle soon made jingle history as the Teaberry Chewing Gum theme song. The band and the business, A&M records, were a huge success. Fast forward four decades and the modest, publicity-shy Alpert and his wife, singer Lani Hall, have become premiere American arts patrons, doling out generous grants to artists at both start-up and mid-career stages. 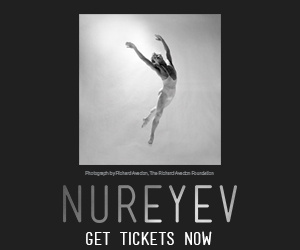 I write in The Jewish Journal of Los Angeles about a young ballet dancer who is a recent recipient of Alpert’s largesse. Herb’s music will be featured at Josh Kun’s exhibit “Jews & Vinyl” and the “Mazel Tov Mis Amigos” listening party at the Skirball Center. Read it here. we called ourselves the Paris Tijuana Brass. We were only about 16 years old when we won third place (out of 142 acts of various types) in the Illinois State Fair Young America competition. (Our downfall was that we had no stage presence.) It was the same year Herb and the Brass played the fair: 1968, I believe. However, their performance was on a different day, and back then none of our families had the money to make another trip to Springfield to see them in person. To this day, I regret not having the opportunity to attend that performance. Always love a story about Herb Alpert. However, there’s a major flaw in your story about the Tijuana Brass. They weren’t “mostly Jewish guys”. Most of them were actually Italian (Nick Ceroli, Pat Senatore, John Pisano, Lou Pagani). Only Herb and his second trumpeter – Tonni Kalash, used only on the road – were the only Jewish guys. Alpert used to quip “We’re four lasagnas, two bagels and an American cheese” in the 60’s. He’ll cringe if you bring that up nowadays. 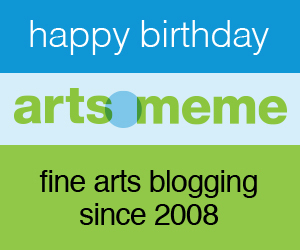 But the Alpert’s have been extremely generous in their support for the arts and are true definitions of “role model”. Herb has been a hero of mine since I was nine years old and because of him I am the musician I am now. 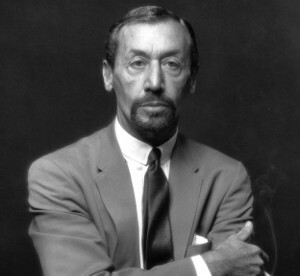 He was kind enough to share a great teacher with me in Carmine Caruso. He will always be my trumpet hero and loved friend. “Herbie” was a classmate of mine at Fairfax High School, and played for the Friday night jitterbugs in the gym along with Fred Santos, piano, and Norm Shapiro, drums. All three were enormously talented — we danced all night, no drugs, no flashing lights, no amplification — just great music and terrific school spirit. Glad to see he’s still going strong. Thanks Debra! I love learning these great bits of LA history from you. Thanks for sharing. When I was 10 my parents rented a motorhome to tour the country for the Bicentennial year. (Remember when red, white and blue was fashionable?) The motorhome came equipped with several 8-track tapes, but my parents wouldn’t allow my brother and me to listen to any of the 70s rock “trash”. We all finally agreed on HERB ALPERT & THE TIJUANA BRASS GREATEST HITS. It played almost continuously for a month as we visited Yellowstone, Mount Rushmore, and particularly the Alamo, where it felt like soundtrack music for our arrival. Good JJ article about the Alperts. I especially like how you end it with Reggie and health insurance. And, I never even imagined Alpert’s real ethnicity! Great investigative reporting!